It’s March Madness time again… I spent all weekend cheering on my Noles and while it didn’t end well, I’m not losing hope for them in the final game of the big tournament. Have you made your NCAA bracket yet? I’m a bit of a softie and always make it with my favorite teams winning (there’s nothing wrong with hope). 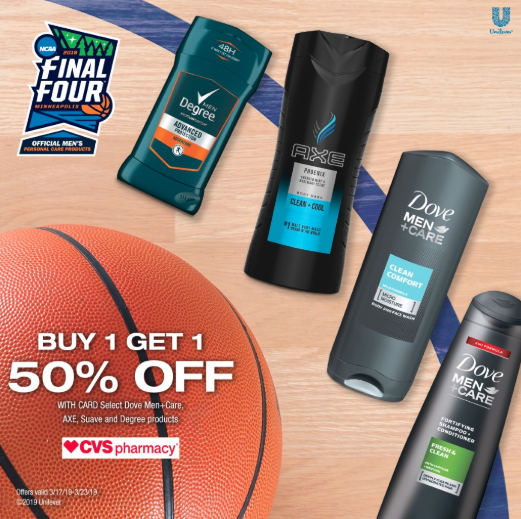 This season though, Unilever wants to help all our guys have a winning bracket with deals on Men’s Grooming products. Let’s face it, the odds are against my favorite team winning, so at least we can win another way! 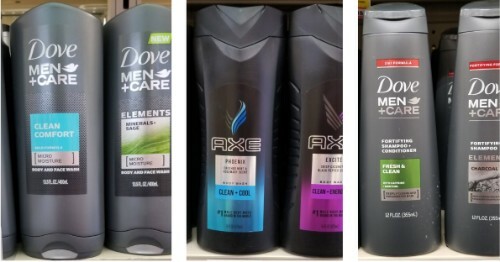 This week head into CVS or shop at CVS.com and get all Dove Men grooming products on sale B1G1 50% off. Plus grab this past Sunday’s coupon inserts for new coupons to pair with the sale! The ends Saturday 3/23. Dove Men+Care Clean Comfort Body Wash – crisp, refreshing body men’s body wash with MICROMOISTURE technology helps keep skin hydrated, healthy looking and strong, and is clinically proven to fight skin dryness better than regular men’s body wash. Degree Men Advanced Protection Deodorant – with long lasting MOTIONSENSE technology, powerful sweat and odor protection with a rugged fragrance that blends clean citrus, energizing fresh pepper and long-lasting notes of woods and musk. Dove Men+Care Fresh and Clean Shampoo & Conditioner – designed specifically for those that want fresh clean hair and have a concern about hair loss. It deeply cleans and invigorates hair with a refreshing effect, and is infused with caffeine + menthol. It helps strengthen hair, leaving it visibly healthy, thicker and resilient, with a dual 2-in-1 formula that functions as a shampoo and conditioner. AXE Phoenix Clean + Cool Body Wash – classic, fruity fragrance features of lavender, geranium, citrus, and coumarone. No. 1 Male Body Wash brand in the world.